Sustainability and environmental issues are a major talking point at the moment. Both Donald Trump and Teresa May deny that climate change exists (‘because snow’- direct quote from Trump!) whilst its effects are being felt across the globe in every eco-system. Our bees have been one species already seeing the devastating effects, with many predicted to become extinct in a matter of years. The new installation in Kew Gardens, Richmond is raising awareness through respect and understanding of the beloved bees. 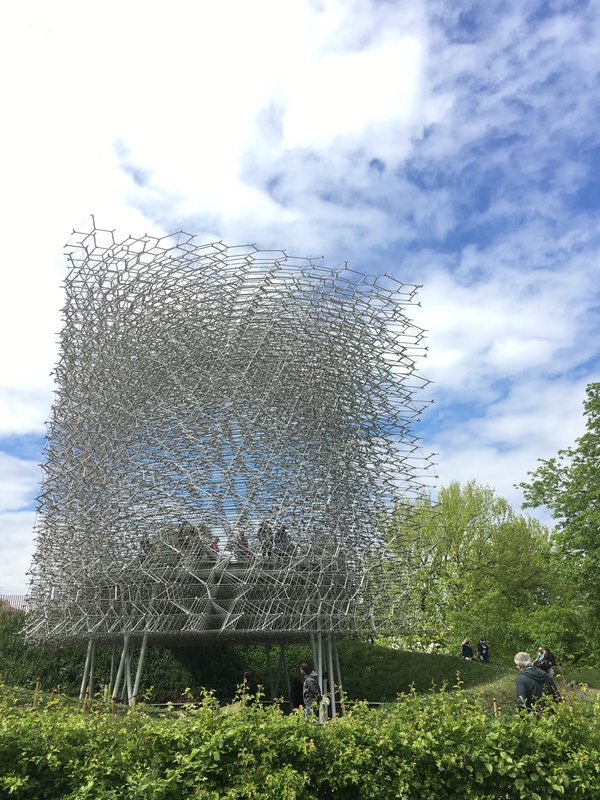 The Hive is a sensory experience from artist, Wolfgang Buttress in collaboration with Dr Martin Bencisk originally created for the 2015 Milan Expo. After receiving worldwide recognition and winning countless awards, the Hive has settled in Kew Gardens for the foreseeable future. Dr Martin Bencisk has spent is scientific career researching the communication methods between bees with hives. His findings have changed the way we understand bees, but for normal ,non-scientist people like myself, the concept can be hard to visualise. In short, the bees communicate through vibrations which move through their bones, in to the ear canal where the sounds are received and turned in to audio data (sound). If you’re anything like me, the sentence doesn’t make much sense. But step in to the hive and suddenly it clicks. I found the sound and feeling of the Hive truly overwhelming. From the exterior, the dense framework seems to enclose the hive in darkness. The aluminium framework filters the light beautifully, changing the feel of the space. The glass floor and honeycomb-esque structure give a spacious and bright atmosphere. Buttress has translated the full body sensory experience of the bees live in the hive to an immersive journey for human visitors. The 1000 LED lights mimic the communicative vibrations were hard to see in the bright midday light and would be better experienced at dusk. The frequency of the flickering lights makes the space feeling overwhelming, as if you are being bombarded with information. The phrase ‘Hive of activity’ is very appropriate here! Kew gardens are open daily from 10am. Located in Richmond, just 30 mins from central London. Travel by train and get 2 for 1 on adult tickets using this voucher. Previous What do I do with all this junk?! My current list of where to send your unwanted stuff. Next Ten tips for solo travel you haven’t heard before!